Calibration Pane is used for calibrating the mocap system through the calibration wanding process. This page provides descriptions on the fields and settings included on the calibration pane. Read through the Calibration workflow page to learn about the calibration process in detail. In Motive, the Calibration pane can be accessed under the View tab or by clicking icon on the main toolbar. This blocks all pixels that are above the set threshold. By default the threshold is set to 200 but this can be changed by the user in the cameras pane. Pixels in a camera image will have a grayscale value between 0 and 255 inclusively. If the default threshold is used, a pixel that is above 200 will be blocked along with the surrounding pixels. You can selected different calibration types before wanding: Full, Refine, Refine Extrinsic Only, Visualize Only. Full: Calibrate cameras from scratch, discarding any prior known position of the camera group or lens distortion information. A Full calibration will also take the longest time to run. Refine: Adjusts slight changes on the calibration of the cameras based on prior calibrations. This will solve faster than a Full calibration. Only use this if your previous calibration closely reflects the placement of cameras. In other words, Refine calibration only works if you do not move the cameras significantly from when you last calibrated them. 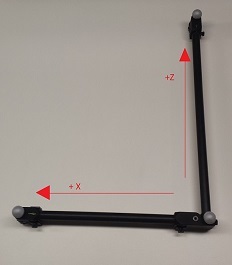 Only slight modifications can be allowed in camera position and orientation, which often occurs naturally from the environment such as mount expansion. Visual: Only render the calibration solution visual and will not calibrate your cameras. 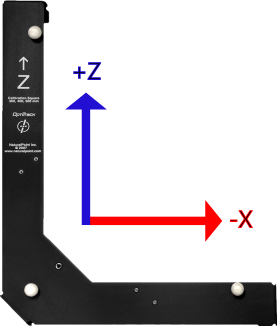 This can be used to validate the quality of existing calibration by comparing position and orientation of the cameras. 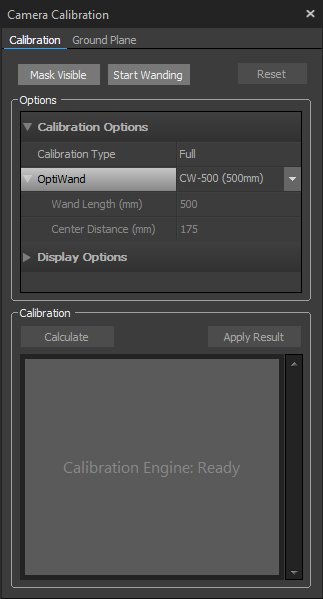 This options allows the user to select which calibration wand their using. The dimension must match the wand exactly in order for the system to be properly calibrated. Wands come in 250, 400 and 500 mm sizes. Custom wands can also be used. A 250 mm wand should be used for smaller volumes or for systems that have cameras with lenses that have larger focal lengths. The reason being that the cameras will not be able to see all 3 markers on a 500 mm wand if the wand is close to the camera or the camera has a very narrow view angle due to it's lens type. If your camera's are not collecting wand samples while wanding, you may need to use a shorter wand. A 250 mm wand is good to use in most small to medium volumes. When making a calibration wand, understand that the system accuracy will be tied directly to the accuracy at which the wand is constructed. A poorly measure wand will result in poor calibration results. To make a wand all that is needed is 3 markers at set distances in a line. Defines the distance in millimeters between the outer post and the center post (use the shorter of the two center offset distances). For use with custom calibration wands. Default: Standard. Decides whether the calibration process is displayed in a list format or a grid format. Grid format allows more camera progresses to be seen in the pane. Default: Visualize. Enables the Status Indicator Ring to glow during calibration in order to display the wanding process. Default: Show. 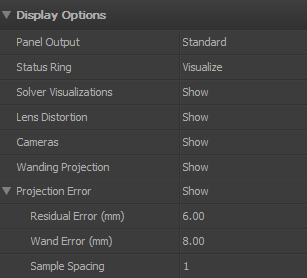 This toggles the display of wand samples and point cloud calibration visuals in the 2D and 3D view. If you're running on a lower end machine or graphics card with a large system, it is best to turn this feature off. The visual display will in fact eat up some computing power you may want reserved for getting quicker calibration results. Default: Show. Use this to toggle the display of the lens distortion solution results in the 2D view. The lens distortion will be represented by a square grid that maps the distortion. Default: Show. This toggles the display of the cameras during the solve. Default: Show. This toggles the display of wand samples projected in the 3D view. Turn this off if you're calibrating a very large system. Default: Show. This toggles the display of error, reported as a color in the projected wand samples and markers. The wand samples will have a color between blue (good sample) and red (poor sample). Make sure the samples you collect are mostly good samples. As will all visual feedback, it may be a good idea to turn this off if you're calibrating a larger system. Default: 6 mm. Set the tolerance for the reported error in the projected marker sample during calibration. Default: 8 mm. This sets the tolerance for the reported error in the projected wand sample. Default: 1. Use this to increase the spacing between displayed samples that are projected in the 3D view. Increasing this will skip more samples but will make the visual wand projections easier to see. Calibration pane during the wanding process. While wanding the bottom part of the Camera Calibration Pane will show a table of the number of samples collected for each camera in the system. The samples will increase as the wand is waved in the capture volume. The calibration results will show in the Calibration Engine portion of the Calibration pane. The elapsed time of the calibration solver is shown at the bottom of the list. If no calibration is being processed this area will remain blank. However, when a wanding or a calibration solver is underway, this field will be populated with a table showing the live results of the solution. The components of that table are described below. Cam This column shows the camera number associated with the row of data, the wanding result or the average result of the camera group. The wanding has error and is reported as the deviation in the wand markers across all samples. Samp The number of samples utilized at the current stage of the solution. This number can climb as the solution converges. Quality The quality given to the current pixel error. You will see the quality increase as the pixel error drops. Quality ranges in the progress bar. Red is poor, yellow is good, and green is excellent. Focal This is the calculated or given focal length of the camera. Doesn't apply to the average or the wanding. PixErr The average pixel error of the camera. Represent the 2 dimensional error of the camera's ability to locate a marker. As the calibration proceeds through the various phases of the solution you may notice the results slowing when a phases is finishing. Let the calibration finish all phases of the calibration. Once the solver converges on an appropriate solution, press the Apply Result button to apply the solution to the cameras. If you are unsatisfied with the results, hit reset near the top of the pane to cancel the results. Set the location of the global origin. Use an 'L' Frame or 3 markers in the shape of an 'L'. If only 3 markers are seen by the cameras, you can simply press 'Set Ground Plane'. If more markers are in view then you can select the 3 markers you want to use in the 3D viewport and then press 'Set Ground Plane'. 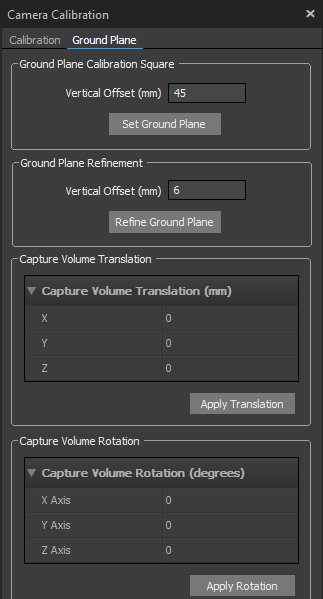 The Ground Plane Refinement feature can be used to refine the ground plane. You can select multiple reconstructions and use the corresponding 3D points to level the ground plane. This refinement feature assumes that the selected markers are all placed on the ground with a given vertical offset (mm) between the marker centroids to the ground surface, and then they use the selected samples to refine the ground plane. Especially in large-scale volumes where the floor is not uniform, defining a ground plane using the calibration square may not be sufficient because it would be referencing just a local part of the volume. For such cases, this feature allows users to further refine the ground plane. The Volume Translation modifies the global origin after it has been set.